Over the past two decades, the importance of measuring, presenting, and evaluating investment performance results has dramatically increased. With the growth of capital market data services, the development of quantitative analytical techniques, and the widespread acceptance of Global Investment Performance Standards (GIPS®), this discipline has emerged as a central component of effective asset management and, thanks in part to the Certificate in Investment Performance Measurement (CIPM) program, has become a recognized area of specialization for investment professionals. That's why Investment Performance Measurement: Evaluating and Presenting Resultsthe second essential title in the CFA Institute Investment Perspectives serieshas been created. CFA Institute has a long tradition of publishing content from industry thought leaders, and now this new collection offers unparalleled guidance to those working in the rapidly evolving field of investment management. Drawing from the Research Foundation of CFA Institute, the Financial Analysts Journal, CFA Institute Conference Proceedings Quarterly, CFA Magazine, and the CIPM curriculum, this reliable resource taps into the vast store of knowledge of some of today's most prominent thought leadersfrom industry professionals to respected academicswho have focused on investment performance evaluation for a majority of their careers. Divided into five comprehensive parts, this timely volume opens with an extensive overview of performance measurement, attribution, and appraisal. Here, you'll become familiar with everything from the algebra of time-weighted and money-weighted rates of return to the objectives and techniques of performance appraisal. Filled with invaluable insights from more than fifty experienced contributors, this practical guide will enhance your understanding of investment performance measurement and put you in a better position to present and evaluate results in the most effective way possible. PHILIP LAWTON, PHD, CFA, CIPM, heads the Certificate in Investment Performance Measurement (CIPM) program at CFA Institute. His previous experience includes serving as vice president at State Street Analytics, where he supported the investment consulting firms that belong to the Independent Consultants Cooperative, and at Citibank, where he headed U.S. performance measurement in Worldwide Securities Services. 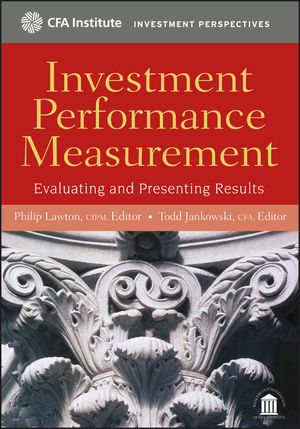 Lawton is a frequent speaker on institutional investing and performance measurement at industry conferences. TODD JANKOWSKI, CFA, is Director of Curriculum Development for the Certificate in Investment Performance Measurement (CIPM) program at CFA Institute. Prior to joining CFA Institute, he was head of investment research in the Wealth Management division of Northwestern Mutual Life Insurance Company, where he had earlier held investment management positions in the Retail Advisory and Institutional Private Placement divisions.